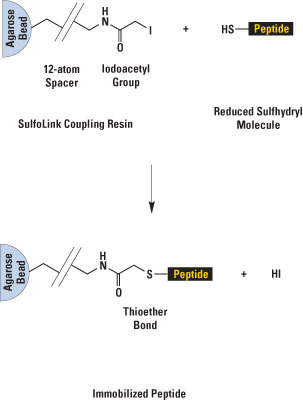 Covalently immobilize cysteine-peptides or proteins (sulfhydryl-ligands) for affinity purification using iodoacetyl-activated agarose beads and columns. SulfoLink Coupling Resin is porous, crosslinked 6% beaded agarose that has been activated with iodoacetyl groups. When incubated with a solution of peptide or protein that contains reduced cysteine residues, the iodoacetyl groups react specifically and efficiently with the exposed sulfhydryls (-SH) to form covalent and irreversible thioether bonds that permanently attach the peptide or protein to the resin. The result is a custom-made affinity resin for purification of antibodies, antigens and other molecules of interest. Complete SulfoLink Immobilization Kits are available for peptides and proteins. Each kit contains all the reagents for preparing the respective peptide or protein sample and five columns containing 2mL of SulfoLink Resin that can be used in either gravity-flow or centrifuge format for efficient coupling reactions and multiple cycles of affinity purification. A single-column Trial Kit for use with either peptides or proteins is also available, or the SulfoLink Coupling Resin can be purchased separately.